It is not a "two person preliminary accord" (as British Intelligence disgracefully planted everywhere). 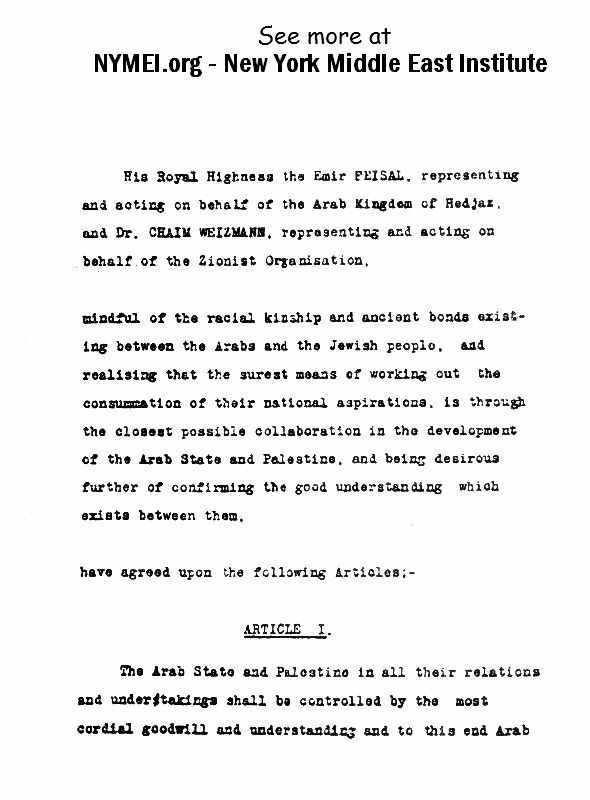 This Treaty is signed by the plenipotentiary officially elected delegations of the Arab and Jewish nations. 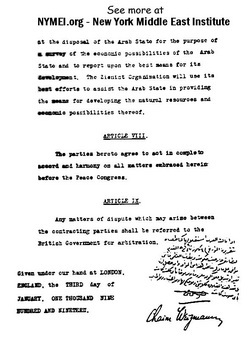 It is signed over two weeks prior to the Paris Peace Conference. 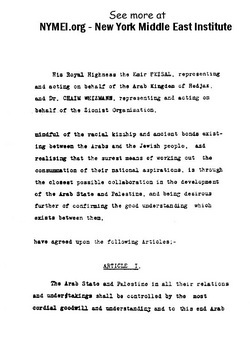 Arab and Jewish national delegations ratified this Treaty on that conference. 1. The Treaty of Versailles (Paris Peace Conference), 1919-06-28, ratified by all the nations of the world. All the countries and nations of the world ratified it once again with the Covenant of the League of Nations. Most of the nations ratified it in between 1919-06-28 and 1920-08-10. Turkey and USA ratified it later. 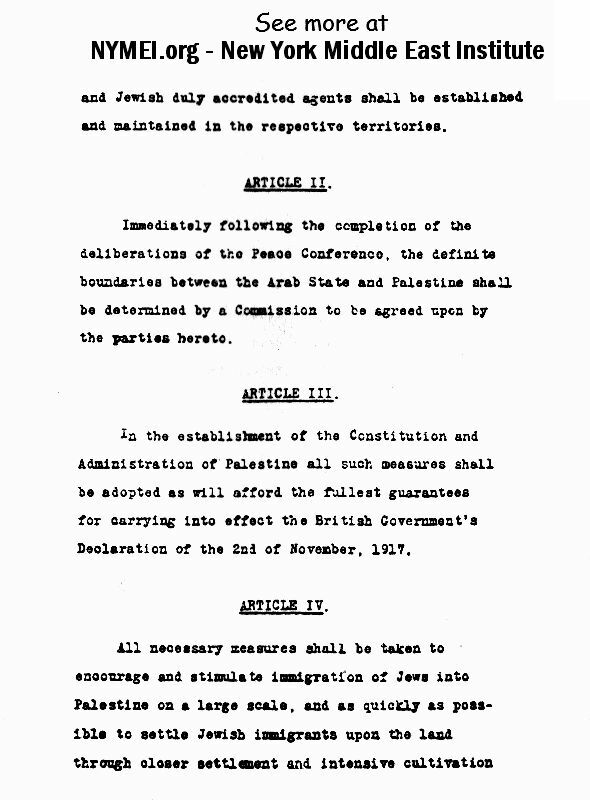 of the Mandate (and, accordingly, of the Arab-Jewish Treaty it is based on). the only real specialists who have proved themselves. We are 100% ready to save Israel - just let the real doctor save the patient! 4. Anglo-American Convention of 1924-12-03 (ratification by the USA). it is our main instrument to save Israel from UN's attacks and from all other assaults to kill. 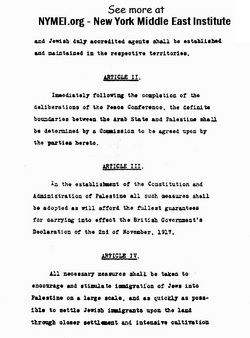 Treacherous Israeli government made this essential treaty removed from so-called "professional" qualification dissertations and disquisitions. It is very easy to control paid professionals - they panicky afraid to lose certification and/or government money-flow. So professional historians and lawyers quickly become ignorant and extremely traitorous. They keep eliminating any mentioning of this treaty from each end every textbook or thesis. 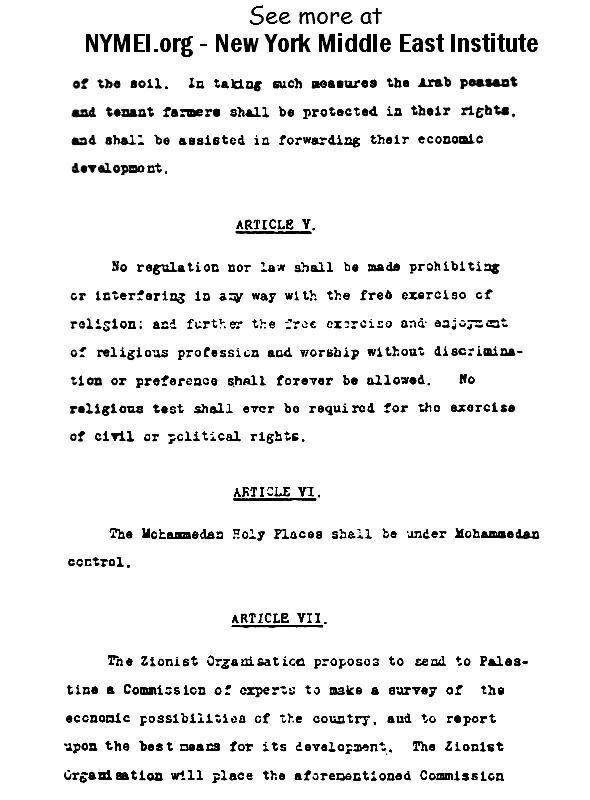 This Treaty is not mentioned even in Jewish Encyclopedia (14-books, 11-volumes, Jerusalem 1976-2005)! Everything is going such a deadly wrong because everything is perverted treacherously. All of so-called "Zionistic activists" aggressively hide the entire existence of this most powerful weapon. All over the world well-paid professionals like Mitchell G. Bard, Howard Grief, Eli E. Hertz, Mark Kaplan are directly involved in such a betrayal of Israel. They do maximum possible to hide form Jewish nation the existence of this mighty weapon, which is completely capable to save Samaria, Judea, Jerusalem, all Jewish land and entire Jewish state! Please let the real doctor save the patient! No regulation or law shall be made prohibiting or interfering in any way with the free exercise of religion; and further the free exercise and enjoyment of religious profession and worship, without discrimination or preference shall forever be allowed. 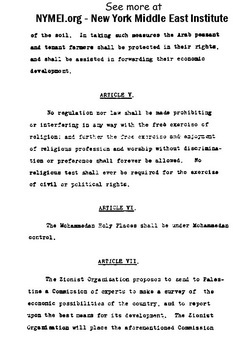 No religious test shall ever be required for the exercise of civil or political rights. 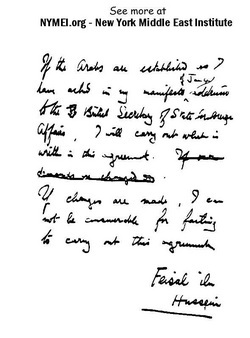 1) As you can see, this handwriting is about an OPTION of Feisal's personal participation in prompt implementation of the Treaty. By no means this handwriting could be considered as any kind of limitation to the Treaty. No more explanations required, but we can do it in order to save time from possible useless meaningless discussions. 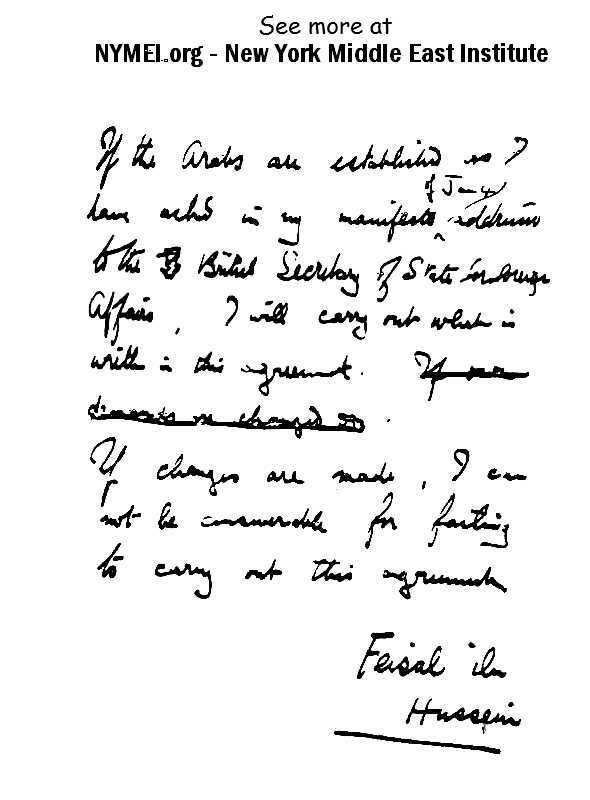 2) Feisal and all his people (Arabs) were given everything they wanted and mentioned in this handwriting. So nobody could find any limitation even to Feisal's personal participation in the implementation of this treaty. 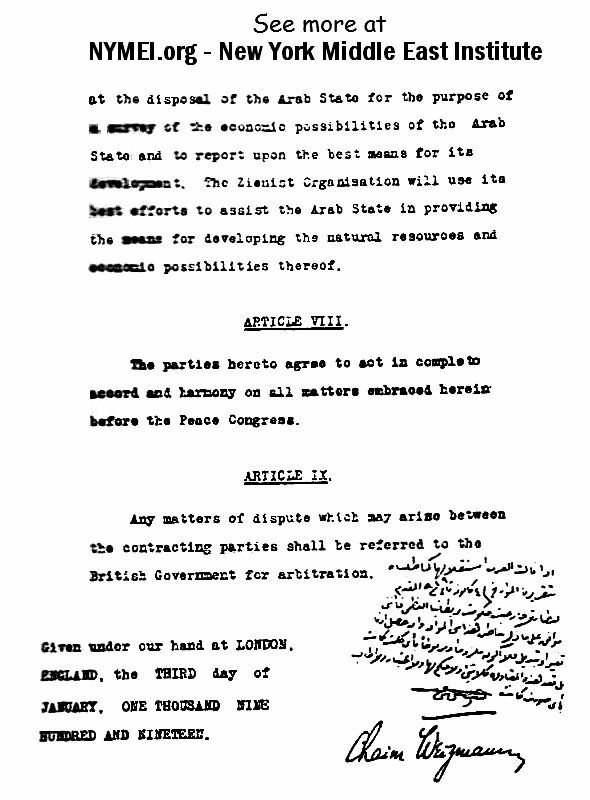 3) All Arabian desires mentioned there pertain to Britain only. So they can not affect Jewish rights for all Palestine. And I repeat: these desites are contented blow-by-blow (in all the details) anyway. As you can see, the highest official delegation of the Arabs nation completely confirmed that Jews have no legal problem Traitorous Israeli officials aggressively lock real specialists out of all resources and even out of all public and scientific conferences. Despite of that betrayal performed by Israeli functionaries, for many years I keep explaining real solutions of all Israeli problems over US and Canadian national channels (TV, radio, web) and in many other publications. In response they drastically extended amount of terrible disinformation delivered via all official Israeli channels. They even started massive spreading of completely wrong text of that handwriting. Internet they spread falsified text of this handwriting! So be careful. Don't believe in falsifications. Use honest sources - us. Feisal's personal translation of his Arabic handwriting. It's an OPTION of Feisal's personal participation in prompt implementation of the Treaty. By all means it is NOT a limitation to the Treaty. Not to mention that Feisal was given everything he wanted and requested. - Wise explanations, pretty often based on our revolutionary discoveries. Resources, hands, brains are needed. Any kind of support is more than welcomed. More explanations are coming to all our pages. but we are very short in web specialists to do the publications. for active fight for saving Middle East, Jerusalem and Israel.